Cally Messick has been teaching and performing in Columbia, Maryland for more than ten years. Prior to having children, she taught elementary band for Howard County Public Schools. She currently operates an active French horn studio. Her students have been selected to perform with the top student performing ensembles in the area including All Eastern Honors Band, MD All State Band, Peabody Youth Orchestra, Baltimore Symphony Youth Orchestra, Howard County GT Orchestra, and the Maryland Youth Symphony Orchestra. Ms. Messick has served as the winds and brass coach for the Maryland Youth Symphony for the past two years. As a performer, she is a permanent member of the Gallery Winds Quintet, which performs recitals throughout the year as well as hosts a chamber music camp in the summer. She has also played with the Columbia Orchestra for fourteen years, the last six as third horn. Additionally, Ms. Messick performed with the Londontowne Symphony Orchestra, Toby’s Dinner Theater Orchestra, Dundalk Community Theater Orchestra, and Spires Brass Band. 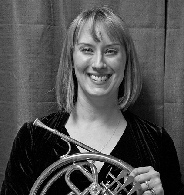 She received a Bachelor of Science in Music Education from Duquesne University in Pittsburgh, Pennsylvania where she studied with William Caballero, the principal horn of the Pittsburgh Symphony Orchestra. Prior to college, she studied with Bruce Moore of the Baltimore Symphony Orchestra for seven years.